Capabilities include filtering, triggering, rotation, instrument correction and coordinate transformations. The filter module provides various filters, including different bandpass, lowpass, highpass, bandstop and FIR filter. Before filtering you should make sure that data is demeaned/detrended, e.g. using detrend(). Otherwise there can be massive artifacts from filtering. 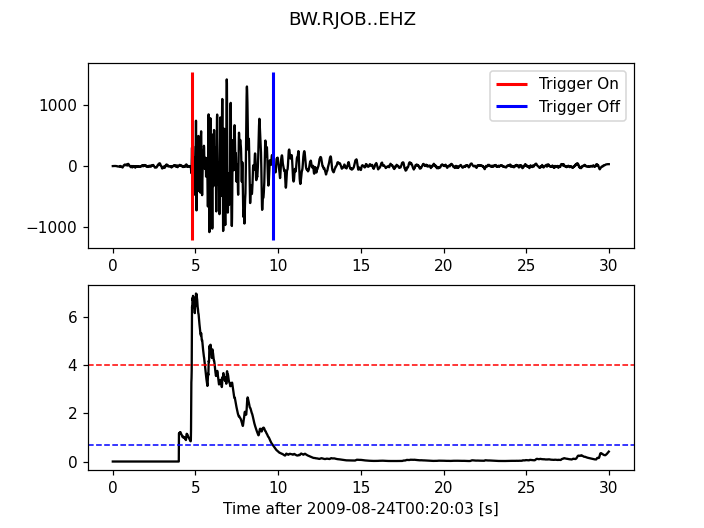 The following example shows how to highpass a seismogram at 1.0Hz. In the example only the first trace is processed to see the changes in comparison with the other traces in the plot. The filter takes the data explicitly as argument (i.e. an numpy.ndarray) and therefore the sampling_rate needs to be also specified. It returns the filtered data. For Stream and Trace objects simply use their respective filtering methods Stream.filter() and Trace.filter(). The response of the instrument can be removed by the invsim module. The following example shows how to remove the the instrument response of a STS2 and simulate an instrument with 2Hz corner frequency. The trigger module provides various triggering algorithms, including different STA/LTA routines, Z-Detector, AR picker and the P-picker by M. Bear. The implementation is based on [Withers1998] and [Baer1987]. There is also a convenience method implemented on Stream/Trace. It works on and overwrites the traces waveform data and is intended for batch processing rather than for interactive determination of triggering parameters. But it also means that the trace’s built-in methods can be used. For more examples check out the trigger in the Tutorial. For network coincidence refer to obspy.signal.trigger.coincidence_trigger() and the same page in the Tutorial. For automated use see the following stalta example scripts. ar_pick Pick P and S arrivals with an AR-AIC + STA/LTA algorithm. carl_sta_trig Computes the carlSTAtrig characteristic function. coincidence_trigger Perform a network coincidence trigger. corn_freq_2_paz Convert corner frequency and damping to poles and zeros. estimate_magnitude Estimates local magnitude from poles and zeros or full response of given instrument, the peak to peak amplitude and the time span from peak to peak. pk_baer Wrapper for P-picker routine by M. Baer, Schweizer Erdbebendienst. linear_regression Use linear least squares to fit a function, f, to data. rotate_ne_rt Rotates horizontal components of a seismogram. calibration Functions for relative calibration. cross_correlation Signal processing routines based on cross correlation techniques. detrend Python module containing detrend methods. invsim Python Module for Instrument Correction (Seismology). interpolation Some Seismogram Interpolating Functions. konnoohmachismoothing Functions to smooth spectra with the so called Konno & Ohmachi method. polarization Functions for polarization analysis. quality_control Quality control module for ObsPy. regression Python Module for (Weighted) Linear Regression. util Various additional utilities for obspy.signal.